Looking for a truly awesome Resort Destination for your next event? We’ve found one! 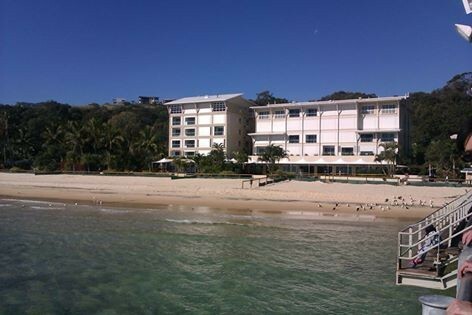 Tangalooma Island Resort on Moreton Island in Queensland is suitable for a Conference, Event, Meeting, Team Building getaway, Retreat, Wedding or simply a superb Family Holiday. Once in Brisbane, it’s a short 15 minute / $35 taxi ride from the domestic airport to Holt Street Wharf in Pinkenba, Brisbane for the 75 minute ferry transfer to this outstanding resort destination. Tangalooma Island Resort has a range of accommodation to suit all budgets, from hotel rooms to luxury apartments right up on the hill with fantastic ocean views across Moreton Bay. We stayed in a Deluxe Hotel Room on the 4th (top) floor of the Kookaburra block. Our view out to the sea and beach was a breathtaking site to wake up to every morning. If you’re wanting to run a Conference or Event, they have a range of Meeting rooms to suit – from a boardroom for 12 to a permanent marquee for 300. End your event day with drinks or a dinner overlooking the stunning beach and sunset. Food choices on the Island range from a Resort Shop where you can purchase every day supermarket items, if you’re staying in a self catering unit with a kitchenette; to the Coffee Shop for snacks and coffee items; to the Beach Café for bistro-style dining; to the Fire & Stone Restaurant where you can enjoy an Asian fusion menu at ‘Fire’, whilst at ‘Stone’ you can cook at your table on a hot rock. For a Team Building getaway there are a myriad of choices. As a family we tried: Quad biking on an exhilarating quad bike track that takes you along the beach and up around the back of the resort on the sand tracks; Desert sand surfing on one of the highest sand dunes I have ever seen – watch out for the 5 minute uphill walk before you surf down! Segways along the beach; as well as some of the complimentary activities available like table tennis and badminton. Also available are parasailing, snorkelling, scuba diving, fishing, tours across the island, and a range of other complimentary activities like tennis, basketball, volleyball, etc. You can have a totally action packed stay at this exciting and memorable resort destination, or just kick back and relax by one of the resort pools! Last but not least, don’t forget to participate in the wild dolphin feeding. Since 1992 wild dolphins have been visiting the shores of Tangalooma to be hand-fed. Approximately 12 dolphins came up to the shore each night when we were there and we fed hand-fed several fish to Storm, Silhouette, Tinkerbell and her baby. Wow, what a memorable experience! We stayed on the Island for 4 nights, but could easily have stayed for much longer – we will be back!